The other day I got asked to do an interview for a GamesRadar article. 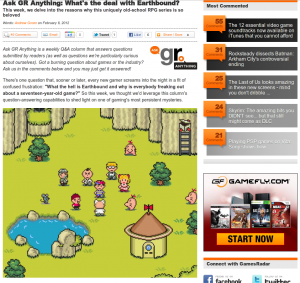 I didn’t really know what it was for until now – turns out it was for one called Ask GR Anything: What’s the deal with EarthBound? Basically, the question posed is: What the hell is Earthbound and why is everybody freaking out about a seventeen-year-old game? Q: What about the game do you think has sustained such an enduring community? It’s kind of remarkable that there’s such a dedicated fan presence when only one game has been released in the West. A: I think it’s two things: 1. the game just has so much heart, the kind that’s hard to find in most games, and 2. the fact that only one game has been released give it a sort of underdog feel, and everyone loves an underdog! If I had to give a third reason, it might be that the unique look at Western culture from Japanese eyes – in GAME form, no less – has a charm all its own. Q: Has Nintendo addressed Earthbound fans about new games in the series or localizations? Are there any plans? A: Aside from Reggie commenting on the enthusiasm of MOTHER fans, there hasn’t been much of anything from NOA about the series. I think as far as they’re concerned, the series is long, long dead. Q: I’ve heard fans say that the game is very ahead of its time. Can you explain what makes that game ahead of its time? A: I think fans could give dozens of thoughtful responses to this. A lot of RPGs back in the day were overly serious and based around medieval themes. EarthBound was one of the first RPGs to really act silly, utilize a modern setting (which is much more common in RPGs now! ), and have a more set piece-laden story, like you see with blockbuster titles nowadays. The game’s presentation was also pretty ahead of its time – it has like 120 or more different music tracks, which was unheard of at the time. And they’re all from wildly different genres, it was just crazy. EarthBound’s graphics were regularly criticized for being too cartoony and not filled with zillions of colors. The game’s cartoon style was definitely an artistic choice, though, not an accidental limitation. Only many years later, with games like Wind Waker and Killer 7, did game designers and players really start to embrace the idea of purposeful art styles to build atmosphere. That’s my take on it, at least. I’m sure many people have different opinions on the matter! Congrats Mato! That was a great article. I love that it’s all, “Why is everybody making a big deal about this 17 years later?” People are? I have only met two other people in my whole life that have played it, which is a shame because I totally want to laugh about the funny parts with somebody else. Even when I got it back in ’96, I kept my original copy and box this whole time because I loved it so much! Your observation that EarthBound has a “set piece-laden story” is dead on, and it’s an attribute that I often point out to other people when espousing the game’s merits. At its core, EarthBound has a fairly generic plot: save the world. It’s something we’ve seen a hundred times before in other RPGs. But the game’s set pieces set it apart from its peers. Instances like the traffic jam in Dusty Dunes, the department store black-out, Poo’s mu training, or the befriending of Dungeon Man elevate the rudimentary narrative into something memorable and engaging. In EarthBound, the destination is less important than the journey itself. I think your responses were accurate and concise, and they really did add to the article. Thanks for sharing! There is a mistake: They said that the protagonist of Mother 1 is Ness. Yeah, I noticed that. It also sort of gave a vague misconception that all the games in the series have the musical combo system, or that at least EarthBound did. Gaha, they even use that screenshot of Earthbound you see everywhere, but with one of those filters on it this time. They could have had someone who’s ever even played EarthBound proofread that article before they posted it. A few things they say in there are mistakenly attributed to the wrong game or the series as a whole, and a couple of things are straight up wrong or misleading. I think the worst is that they make it sound like EarthBound is the game with the little rhythm combat system. I don’t think that pic has a filter on it, it looks like regular jpg-ness though. I read this yesterday. It was a pleasant surprise. Also, Mato, did you know you have a Wikipedia article? Check it out, it’s cool. They should have just let Mato write the article. hmm, Earthbound, Wind Waker, and Killer 7… three games I love!